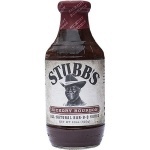 The sweetest of Stubb’s Bar-B-Q sauces, the state tree of Texas, the Pecan, gets paired with real honey, tangy tomato and apple cider vinegar to make a sauce like no other. Water, *Corn Syrup, Tomato Paste, Sugar, Distilled White Vinegar, Honey, Salt, Molasses, *Corn Starch, Spices, Onion (Dried)Garlic (Dried)Natural Flavours. *Produced from genetically modified maize. **May have an adverse effect on activity & attention in children. Difficult to find in U.K., this sauce I found in TK Maxx but sadly smashed the bottle half full. An internet search revealed that American Foods listed it but were out of stock; but they let me place an email reminder. Good to their word, they sent me a note, I ordered it and it came 4 days later. If you haven't tried this sauce, I can highly recommend it as a BBQ enthusiast and big fan of Texas BBQ methods, flavours and techniques. This is real deal and you won't be disappointed!